In the leaves, water molecules leave the xylem vessels and move from cell to cell. They move through the spongy mesophyll layer by osmosis along a concentration gradient. 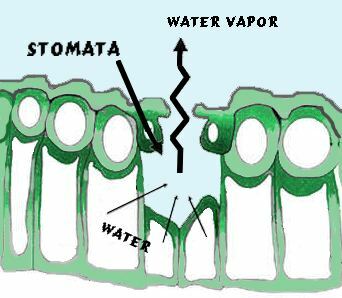 Water then evaporates into spaces behind the stomata and diffuses through the stomata into the surrounding air. 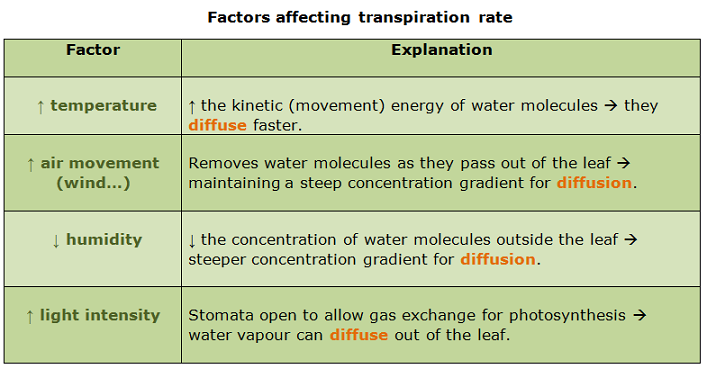 Transpiration is the evaporation of water at the surfaces of the mesophyll cells, followed by loss of water vapour from plant leaves, through the stomata. Water in the leaf cells forms a thin layer on their surface. The water evaporates into the air spaces in the spongy mesophyll. This creates a high concentration of water molecules. They diffuse out of the leaf into the surrounding air, through the stomata, by diffusion. Water molecules are attracted to each other (cohesion) à water vapour evaporating from a leaf crates a kind of suction, pressure of water at the top of the vessels is lower than that of the bottom à water move up the stem in the xylem, more water is drawn into the leaf from the xylem. This creates a traspiration stream, pulling water up from the root. 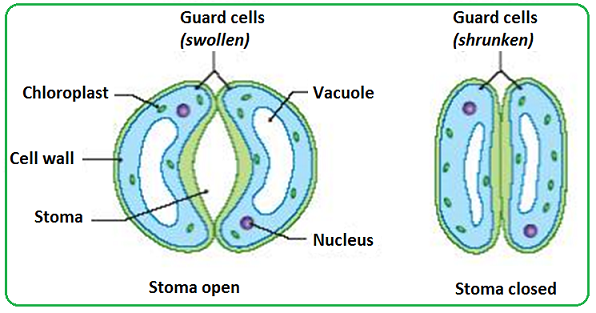 The opening and closing of the stomata is controlled by the guard cells. In light, guard cells take up water by osmosis and become turgid. Because their inner walls are rigid they are pulled apart, opening the pore. In darkness water is lost and the inner walls move together closing the pore. Because of this, the transpiration rate is increased by an increase in light intensity. * Most of the factors that result in a change in transpiration rate are linked to diffusion. When writing explanation, try to include references to the concentration gradient caused by a change in the factor. Young plant stems and leaves rely on their cells being turgid to keep them rigid. If the amount of water lost from the leaves of a plant is > than the amount taken into the roots à the plant will have a water shortage à cells become flaccid (soft) and will no longer press against each other à Stems and leaves lose their rigidity, and wilt.